2. Is the African elephant the largest land animal? 3. What is the longest river in Africa? 4. What is the highest mountain in Africa? 6. The largest waterfall in the world is in Africa. What is it? 7. How many countries are there in Africa? 8. What is the largest lake in Africa? 9. What is the coldest place in Africa? 10. What is the fastest land animal? 11. What is the biggest country in Africa? 12. 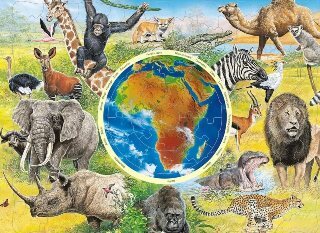 Africa is the ________ biggest continent in the world. 13. What animals transport goods across African deserts? 14. Are there tigers in Africa?